Broken teeth are one of the most common dental problems seen. In dogs, fractured teeth commonly occur after chewing on an inappropriately hard item, after forceful trauma (such as a baseball bat or golf club accidents), or when a pet gets in a fight with another animal housemate. 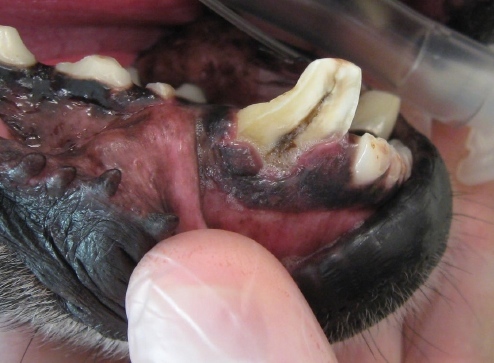 In puppies, broken teeth are sometimes seen when teeth are intentionally "clipped". In cats, fractured teeth are most often seen after hit-by-car trauma. Fractured teeth hurt and become infected. 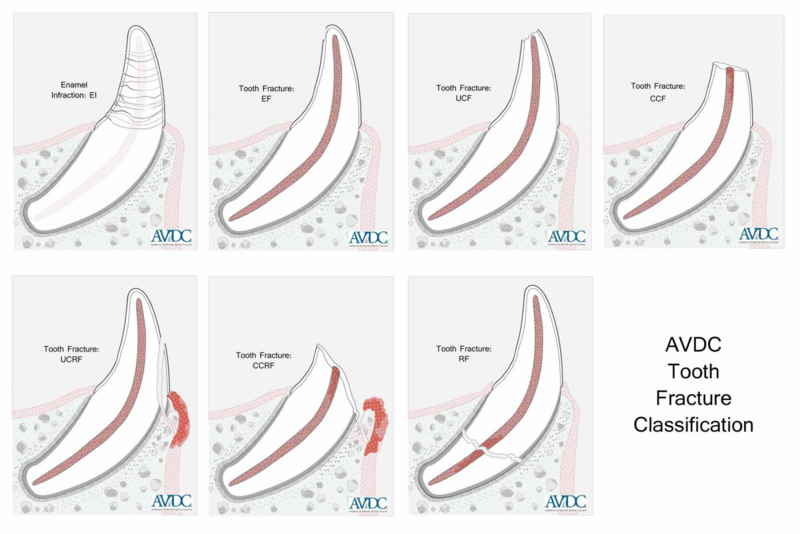 The tooth is comprised of three main layers: the outer enamel, the middle dentin, and the inner pulp. The pulp contains living tissue made up of arteries, veins, lymphatics, connective tissues, and nerves. This is where the sensory pain receptors are located. The pulp, when exposed, may appear pink or black (as seen above). Sensitivity occurs when teeth have enamel or dentinal damage. If the inner pulp is exposed, it is painful, and infection will develop. Even the cleanest mouth has bacteria. Once pulp is exposed, bacteria take advantage of the opportunity and invade the tooth. With time, bacteria spread to surrounding tissues; this progression of infection can lead to tooth root abscesses, draining tracts, and weakening of the jaw bone. Depending on where the infection is located, other nearby structures could be affected - e.g. facial swelling, eye problems, chronic nasal discharge, etc. It is important to note that most pets never show overt signs of pain or discomfort. Pets tend to show more subtle signs. Animals will sometimes avoid chewing on the same side as a fractured tooth and increased plaque and calculus at the affected tooth results. Other pets may be seen pawing at their face, be reluctant to play with toys, or may stop eating hard food and treats. Flinching, drooling, vocalization, change in temperament, inattention, reduced sense of smell, or inexplicable circling to the affected side may also be seen. In people, fractured teeth are painful, yet dogs and cats are unreliable in displaying obvious signs of oral pain. 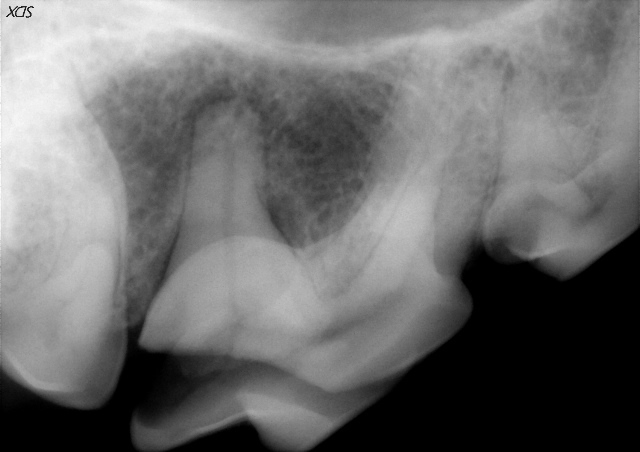 Detailed examination and dental radiography (x-rays) are required when assessing and deciding the proper treatment for fractured teeth like the one seen to the right. Fractured teeth with no pulp exposure and no radiographic changes can often be treated with a dentinal sealant and/or composite restoration. It is important to note that teeth treated with sealants or composites may still get infected, so follow up recheck radiographs are obligatory. If pulp exposure is present in a fractured tooth of a pet under 2 years of age who fractured it within the last 48 hours, vital pulp therapy could be considered. If pulp exposure is present in a fractured tooth, root canal therapy or extraction should be performed as soon as possible. Root canal therapy is ideal because the tooth can be saved and no extensive surgery is necessary. It must be assumed that these fractured teeth are painful, even if the pet is not showing obvious signs. Infection can spread at any time. When a fractured tooth with pulp exposure is noted, treatment should be performed as soon as possible. A watch and see approach is never advised. If the tooth that is fractured is a deciduous (baby) tooth, it should be extracted as soon as possible with extreme care to avoid damage to the developing adult tooth. 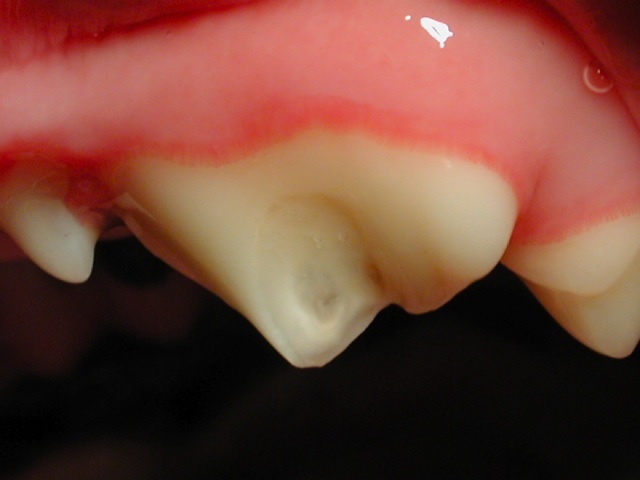 Waiting for the damaged deciduous tooth to exfoliate on its own is risky because infection could spread to the unerupted developing adult tooth. Finally, the purposeful "clipping" of teeth should be avoided as this process causes pain and can contribute to infection or damage to the unerupted, developing adult teeth.